Retreat to our Elegant Volcano Hawaii Bed and Breakfast, on the Big Island near Hawai’i Volcanoes National Park. The Cottages – Peaceful RefugeAfter your volcanic adventures, retreat to one of our four luxuriously appointed accommodations. Our elegant Volcano Hawaii lodging, offers bed & breakfast romantic charm without sacrificing the amenities of a fine hotel. Like the sacred Lotus flower, where each petal reveals hidden jewels that nurture and revitalize the soul, Lotus Garden Cottages is the perfect stepping stone for exploring the natural wonders of Hawai’i Volcanoes National Park and the summit of the Kilauea crater. Venture out to discover geological wonders of richly textured lava fields, steam vents, lava tubes, deep craters, petroglyphs,fiery glows of molten lava, and magnificent cliffs with sweeping ocean vistas. The Hawaii Volcano National Park offers tours, guided hikes, lava flow viewing, demonstrations, hula, dining, entertainment & more. Experience Quiet TransformationSpend a quiet day of contemplation in our tropical Zen garden. Like a musical score, this pristine hamlet of majestic Ohia trees, giant ferns and vibrant mosses, nurtures the soul with its varying tempo of sunshine, rain, warm days and cool nights. Bright blue skies and golden rays shift into romantic vistas of mist and fog, only to be undone by the surprise of shimmering rainbows. Drift to sleep under starry skies or to the lull of raindrops. Awaken to a rose-colored dawn and the song of the native Apapane. After a day of exploration, treat yourself to a private traditional Hawaiian Lomi Lomi massage, Reiki session, or unwind in a steaming outdoor hot tub. This mystical rainforest provides a welcome haven to relax, decompress and heighten your senses, creativity and passion. art galleries, studio tours and annual special events. 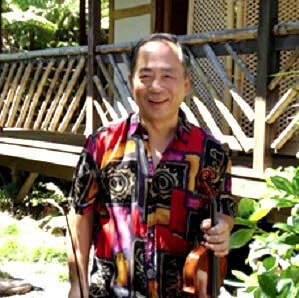 ​Established in 2005, Lotus Garden Cottages Bed & Breakfast proprietor, John Kim, left the crazy world of information technology behind to pursue his love of nature and volcanoes, and created a peaceful respite from a fast paced world. Once immersed in this ancient volcanic rainforest, he felt compelled to share his idyllic paradise and opened the gates to the luxuriously appointed Lotus Garden Cottages B & B. A music lover at heart and classically trained, whispers of John’s melodic violin concertos serenade guests as they stroll along garden paths or relax by the Koi pond. Reminiscent of gentle Volcano mists, John’s compositions are inspired by resplendent forest hues and silver moonbeams that shimmer in the night sky. John’s Korean heritage sets the tone for a blissful refuge with the perfect blend of Asian and Hawaiian hospitality. Deeply touched by teachings of the sacred Lotus flower and magic of Goddess Pele, John has created a magnificent haven designed to unveil your inner self. Known for its gracious hospitality, Lotus Garden Cottages has become an eclectic oasis where busy urbanites from around the world seek refuge, slow down, take a deep breath and revel in extraordinary volcanic wonder. An exquisite blend of delicate Asian inspired decor and Hawaiian Spirit of Aloha, this beautiful cottage with cedar interior is the perfect respite from the daily grind. Forget your worries and immerse yourself in our luxurious amenities with king size bed, cathedral ceiling, private lanai, catered tropical breakfast, and outdoor hot tub where iridescent forest and tropical Zen garden views abound. Experience thoughtful interiors designed to feed the soul and rest the mind. Revel in the treasures of renewed strength and vitality. Gift yourself with hikes and nature tours of extraordinary beauty. After a full day of discovery, sink into comfy furnishings with samplings from our collection of books, movies and history of the Hawaiian Islands. Capture the wisdom of Hawaiian legend and drift to sleep as the poetry of Pele weaves her magic through delicate, dancing breezes of emerald tree ferns. Ideal for couples and adventurers at heart. Experience our spacious, heavenly haven for honeymooners and travelers seeking the gift of romance. A stunning traditional silk Japanese wedding Kimono, reflective of harmony and love, adorns a plush king size bed and sets the tone for an interior designed for unity. Indulge in plush robes, private massage, romantic evenings and lyrical moonlit strolls or linger over a catered, tropical breakfast on your secluded lanai. Following a day of adventure, luxuriate in an elegant rain water shower or inviting hot tub, stretch out by the fireplace and settle in for an enchanting evening of stargazing. Watch as gentle moonbeams dance through celestial skies and ancient volcanic forests. At Lotus Gardens Cottages Bed and Breakfast, treat yourself to a memorable experience of relaxation and serenity, steeped in an exotic blend of rich Asian heritage and Zen gardens. Like the lotus flower as it awakens to a new day, our elegant surroundings will refresh your spirit and sense of vitality. Perfect for honeymooners and the happy wanderer.